If you don’t have an 888Sport account yet then standby for action with their latest brilliant sign up offer. Deposit £10 using code 30f using card. Members depositing with PayPal, Entropay, Paysafe. Note Neteller or Skrill will not be eligible for this promotion. Quick. Simple. And of of course plenty of options to lock in a decent risk free profit. First qualifying bet must be placed within 30 days of registration. that can only be used on a mobile device).£/$/€30 Free Bets in total. Free bet tokens expire 7 days after credit. Free bet token can only be redeemed on a mobile device. Free bet token must be used in their entirety. They cannot be used to place a succession of smaller bets. It would seem just about every bookmaker out there at the moment wants to give you a little extra & 888Sport are no different. 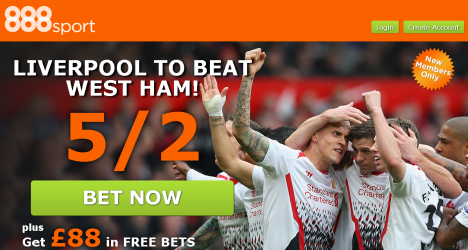 Open a new 888sport account, place a ‘real money’ single of £10 or more on Liverpool to beat West Ham on 06/04/14 at the normal odds on 888sport as your first bet. If your bet is a winner, you will be paid at normal odds directly after the match. The extra amount will be credited the following day, giving a cumulative payout of 5/2 (Please allow 48 hrs in the event of extenuating circumstances). Offer applies to new customers only. Existing or previous 888sport customers do not qualify. So you even have a great value punt or turn this into a very tasty risk free arb opportunity. At the time of typing Liverpool were 1.53 to lay on Betfair meaning you can lock in a very tasty £14+ guaranteed risk free profit whatever the outcome and collect a free £10 bet too to get you started on their brilliant £88 in free bets offer. Here is our spreadsheet showing the 3.50 back price with 888Sport against the 1.43 lay price on Betfair and the £14.09 profit from just this single bet. 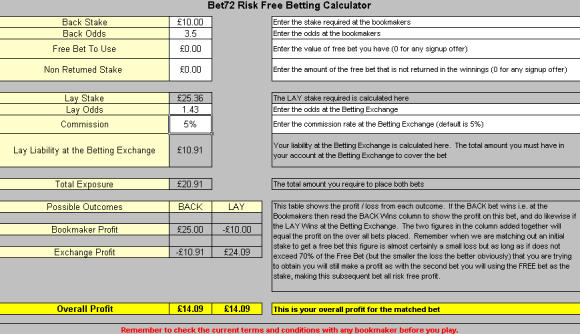 So some guaranteed risk free profit, a free £10 bet and the option to collect another £78 in free bets too. We think the words No and Brainer spring to mind. And naturally we have 888Sport added to our odds finding software, Oddsmatcher, so finding all the bets you need is always just a click of a mouse away. Just click below to grab the price boost of the season so far…. Offer is valid from Thursday, 03/04/14 until match kick off. Maximum stake for enhanced odds is £10. If you place a bet of more than £10, the remainder of the stake will be paid at normal odds. Available to customers from UK, Ireland, Netherlands, Sweden and Canada only. Pre match singles only. Live bets and multiple bets do not count. Offer is limited to one per person, household, IP, computer, e-mail address or payment details. All qualifying bets must be ‘real money’ stakes of at least £/€/$10 with all selections at odds of Evens (2.0) or greater (for each way bets total stake must be a minimum of £/€/$20). Each bet within Permutations are treated individually for qualification purposes. Free bet tokens will be applied upon qualifying bet settlement and expire after 30 days. Free bet tokens can be redeemed on win Singles and ‘straight line’ Multiples but cannot be redeemed on each way bets or Permutations. Free bet tokens must be redeemed individually; they cannot be combined with ‘real money’ stakes. Bets that are ‘Cashed in’ do not qualify. Non-runners/void bets do not count as qualifying bets. Duplicate bets on the same selection in the same event do not count as qualifying bets. The welcome offer expires 90 days after registration. Offer is limited to one per person, household, computer, e-mail address or payment details. This offer cannot be used in conjunction with any other registration offer. 888sport reserves the right to withhold or retract any free bets and winnings generated from these if free bet tokens are mistakenly credited or patterns of abuse are found. 888sport’s decision is final on all matters relating to the awarding of any bonus and shall not be subject to review or appeal by an entrant or any third party. All new customers located in certain jurisdictions, territories and states (other than the United Kingdom) may be deemed ineligible for this offer at the absolute discretion of 888sport. Ineligible jurisdictions may be confirmed with 888sport Customer Services prior to application. 888sport reserve the right to modify, suspend or cancel this promotion without prior notice. 888sport’s 88th minute Special – Score a late winner! Place a single bet of at least €/£/$5 in the To Win (90 Minutes), Last Goal Scorer or Correct Score markets all English Premier League and Champions League matches. If a goal is scored by either team from the 88th minute until the end of normal time which results in a losing bet – you just won a FREE BET up to €/£/$50! Place a bet of at least £1/€1 on any market offered by 888sport, with minimum odds of 1.5. Won? Great! Lost? No worries we’ll refund your lost stake up to £5/€5! 888 Winning Streak is your chance to WIN a whopping £888,888 in one swoop… and it’s FREE to play! With a mouth-watering £888,888 JACKPOT for the WINNER, 88 RUNNER-UP PRIZES as well as individual round prizes and mini-league prizes , the 888 Winning Streak is one of the most lucrative predictor games right now! Based on the UEFA European Football Championship 2012. Players must successfully predict the outcome of all 31 games in the competition – from Matchday 1, all the way through to the Final! …and if you get one prediction wrong – Don’t Worry! You are still in the hunt for one the 88 runners up prizes, inidivual round prizes and mini-league prizes and you also have the option to come back into the game and amend any selections right up to kick off time of each match. The game will begin with the first Group Stage matches on 8th June 2012, and will run through to the Final on 1st July 2012. 88th minute Special – Score a late winner! Place a single bet of at least €/£/$5 in the To Win (90 Minutes), Last Goal Scorer or Correct Score markets in the games featured below. Fancy a free £50, silly question really and of course being bet72.com, we can lock in some guaranteed profit too, no problem. Well 888SPORT have just launched a great new bonus. Easy as 1-2-3. Of course 888SPORT are included in ODDSMATCHER too so the whole process could not be easier. And 888SPORT are well known for providing plenty of offers for current users too. So once you are up and running there will be plenty more offers and bonuses coming your way! Click below for full details…..
Open an account with 888sport and place a bet of at least £10. 888sport will then credit your 888sport account with a £10 free bet token. Afterwards every 4 bets of at least £10 each will earn you a ‘bet bonus’ free bet token of £10 up to a total of £50. Only bets of at least £10 each will count towards your next free bet (bets of a lower value do not affect your entitlement to the offer). 1. Offer applies to new customers only. Existing or previous 888sport customers do not qualify. 2. All qualifying bets must be a minimum of £10 and must be placed at odds of evens (2.0) or greater (for each-way bets total stake must be at least £20). Multiple bets count as one bet and all legs must be placed at odds of evens (2.0) or greater. 3. Free bet stakes are not included in any returns and expire after 30 days. 4. Free bet tokens must be used in their entirety. They cannot be used to place a succession of smaller bets. 5. If the odds of the selection on your first bet are less than evens (2.0) your next bet at evens (2.0) or greater will qualify for the free bet. 6. 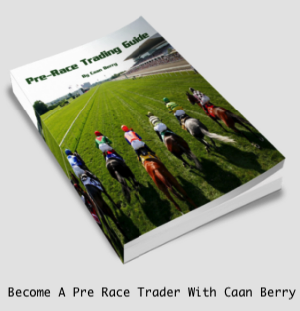 Non-runners do not count as qualifying bets. 7. Duplicate bets on the same selection in the same event do not count as qualifying bets. 8. The loyalty bonus promotion ends 120 days after the customers opening £10 or more bet. 9. Offer is limited to one per person, per household, per computer, per e-mail address or per payment details. 10. This offer cannot be used in conjunction with any other registration offer. 888sport offers are intended for recreational players and 888sport may limit the eligibility of customers to participate in any promotion. Free bet tokens must be used in accordance with 888sport’s general terms and conditions. 888sport reserves the right to withhold or retract any free bets and winnings generated from these if free bet tokens are mistakenly credited or patterns of abuse are found. 11. 888sport’s decision is final on all matters relating to the awarding of any bonus and shall not be subject to review or appeal by an entrant or any third party. 12. All new customers located in certain jurisdictions, territories and states (other than the United Kingdom) may be deemed ineligible for this offer at the absolute discretion of 888sport. Ineligible jurisdictions may be confirmed with 888sport Customer Services prior to application. 13. 888sport reserve the right to modify, suspend or cancel this promotion without prior notice. You can view any free bet tokens you have by clicking on My Account from the home page and selecting the Free Bets option. To redeem a free bet, just make a bet selection the way you ordinarily would. The option to redeem a free bet token on that bet will appear at the bottom of your betslip. Simply mark the box that appears beside it, and select an outcome from the dropdown menu to the right. Something for the weekend? Well Saturday night at Wembley to be precise. You’ll enjoy this year’s Champions League final even more if you try a bit of in-play LIVE betting – and if so, you’ll also be enjoying a £/€ 5 free bet from 888sport! • Simply place a single bet of £/€ 5 in our special Champions League final Live Betting markets and you’ll get a £/€ 5 free bet! Our Player Specials markets include ‘To score a header’, ‘To score from outside the box’, ’To hit the woodwork’ and many more! It’s that easy so don’t miss this chance to bet LIVE! With players like Messi, Rooney, Villa and Berbatov around, you’d be mad not to! For those of your looking for a risk free angle on this one, have a look at No Next Goalscorer and Lay with the Current Score at halftime when it is safe to get you bets on without the chance of a goal. or get over to 888SPORT for all the info. 1. A maximum of one Free bet token will be payable per qualifying member, per match. 2. The maximum free bet token payable per match is €/£/$5/50SEK/50DKK. 3. To qualify, your bet must be ‘real money’ win single bet placed on In Play (during the match) on any ‘Player Specials’ or ‘Next Goal Scorer’ on the Champions League Final between Manchester United-Barcelona on 28/5/2011. 4. This offer does not affect the customers’ rights to participate in other 888sport offers. 5. Qualifying bets must be a minimum of €/£/$5/50SEK/50DKK. 6. Matches must be completed in full in order to qualify for free bet. 7. Free bet token value is not included in any bet returns. 8. Free bet token expires after one month. 9. Free Bet tokens will be applied to accounts within 72 hrs of bet settlement. 10. Free bet tokens must be used in their entirety. They cannot be used to place a succession of smaller bets. 11. Offer is limited to one per person, household, computer, email address or payment details per qualifying match. 12. 888sport offers are intended for recreational players and 888sport may limit the eligibility of customers to participate in any promotion. 13. 888sport’s decision is final on all matters relating to any reward and shall not be subject to review or appeal by an entrant or any third party. 14. Free bet tokens must be used in accordance with 888sport`s general terms and conditions. 15. 888sport reserve the right to cancel this promotion at any stage without prior notice. Are You Game? Here’s £10 Then! Cracking little offer that we almost over looked here, a £10, risk free, to play with at 888SPORT on their new Games area of the site. They are so much better with words than me so here, read this…. Three-and-easy offer for Games-in-Sport Players – a £/€10 NO LOSE games bet! Yes, get a free £/€10 NO LOSE Games bet simply by playing any of three great games – 3D Roulette, Virtual Dogs and/or Virtual Horses! We’ll refund any losses up to £/€10 from the first day you choose to play, and take part in the promotion! Super exciting 3D Roulette gives all the buzz of playing in a real casino and whilst the superb graphics and accurate racing odds make Virtual Dogs and Virtual Horses so lifelike, it’s just like being at the track! * Play any of these 3 so-real-you-could-be-there games. * And if you don’t get lucky? No worries, we pay you back! But HURRY! This offer is for 10 days only! Pick any day you like and good luck. And don’t forget – YOU CAN’T LOSE! Whilst there is no guaranteed way to lock in a profit on this one just think of it as a risk free punt. For example play 3D roulette, £10 on an evens shot i.e. Black or Red / Odd or Even and if you win then you have doubled your money and withdraw (or play on with your free cash if you like and try to double again….etc). Or even stick £1 on 10 random numbers, one spin, if your number comes up £36 back! Again you cannot lose as you will get the £10 refunded anyway. If you get a refund then it must be wagered over x2 in the casino before withdrawal but you can play on any game you like so £1 a hand on Blackjack playing the optimum strategy (we can email you a copy if needed) would be the lowest risk way to go for example. For the record just did a £10 spin on Red myself and Red 14 dropped, so £10 profit here, hurrah! 1. Offer is open from 17/2/2011-27/02/2011, 23:59 GMT inclusive. 2. A maximum of $/€/£10/100SEK/100DKK will be refunded during the promotion period for eligible winners. 3. Offer is only applicable for 3D Roulette, Virtual Dogs and Virtual Horses. 4. No Lose refund must be wagered twice (x2) in 888sport Games, before withdrawal can be made. 5. Wagering requirements can be made on any Casino games but Low Risk bets will not count. This includes covering a number of outcomes in the same game, for the avoidance of doubt any bet with cumulative odds of less than 1.5 is deemed as ‘low risk’. 6. You must be a resident of UK, Spain, Germany, Sweden, Denmark, Canada, the Netherlands and Ireland to take part in this promotion. 7. A player will be eligible to receive this offer on his Total Net Loss in 888sport Games, on their first day of play between 17/2/2011-27/02/2011, 23:59 GMT. Total Net Losses are defined as loss over profit in Games in Sport on that particular day. 8. First Day of Play’ is defined as the first day in which you chose to take part in this promotion and will end at 23:59 GMT, every day, during the promotion duration. 9. No Lose refunds will be added within 72 hours of first days play. 10. Offer is limited to one per person, household, computer, email address or payment details for the entirety of the promotion period. You will only be refunded on the first day you take part in the promotion and cannot be refunded for a second or subsequent days. 11. 888sport offers are intended for recreational players and 888sport may limit the eligibility of customers to participate in any promotion. 888sport’s decision is final on all matters relating to the awarding of any bonus and shall not be subject to review or appeal by an entrant or any third party. 12. 888sport reserves the right to modify, suspend or cancel this promotion at any stage without prior notice. As well as collecting a risk free £20 with your first bet (see here), you can now pick up and extra free £10 by placing 10 (£5) bets on an English Premier League Market up until the end of January 5th. Needless to say we have this all covered by Oddsmatcher, so you can find all the risk free bets you need at the click of a mouse. It couldn’t be easier. Just click below for all the details…..
2. Only bets placed and settled between Dec 24, 2010 & Jan 5, 2011 inclusive qualify. 3. Only residents of UK & Ireland are eligible for this offer. 4. To qualify for the additional £10 free bet members must place a total of 10 x ‘real money’ bets on English Premier League Matches (all markets qualify). Bets must be placed at minimum odds of 1.5 and be a minimum stake of £/€5 each. Multiple bets with cumulative odds of 1.5 and greater count. 5. Duplicate bets & void bets do not count. 6. Free bet token value is not included in any bet returns and expires after 30 days. 7. Free bet tokens must be used in their entirety. They cannot be used to place a succession of smaller bets. 8. A maximum of 1 x £/€10 free bet will be payable per qualifying member, household, computer, email address or payment details. 9. Free Bet tokens will be credited by 5pm Friday, Jan 7, 2010. 10. This offer does not affect the customer’s right to participate in any other offer. 11. 888sport offers are intended for recreational players and 888sport’s decision is final on all matters relating to the awarding of any bonus and shall not be subject to review or appeal by an entrant or any third party. 12. 888sport reserve the right to cancel, modify or suspend this promotion at any stage without prior notice. When 888Sport said they wanted to help our ongoing fundraising effort, we thought it would be an basic donation via the usual means (here) but oh no they wanted to help big, £500 big! Yes they popped 5 x £100 free bets into our online account for us to use as we wished and donate the profits to our Manchester 10K appeal for Rainbow Trust. Naturally there was only one way to deal with this, the bet72 risk free way and we duly matched each of the 5 freebies on selected horses on Thursday afternoon, laying off on Betfair. 5 races, 5 losers, £404.67 (after commission) in risk free profit in our Betfair account, wow. The money is winging it’s way back from Betfair as we type and will be paid in as soon as it hits! A massive thank you to Roy and all the people over at 888Sport for this extraordinary act of generosity and suffice it to say if you are looking for someone to have a wager then look no further than 888Sport as naturally these folk get a massive thumbs up from bet72. Hey you can pick up, upto £50 in free bets by opening a new account. Naturally we have 888Sport in Oddsmatcher so that free £50 sign up offer is all nice and easy and risk free too! Open an account with 888sport and place a bet of at least £15 and 888sport will then credit your 888sport account with a £15 free bet token. Place a further 9 bets of at least £15 each, and you will qualify for a second ‘bet bonus’ free bet token of £15. Place a further 5 bets of at least £15 each, and you will qualify for a yet another ‘bet bonus’ free bet token of £20. Only bets of at least £15 each will count towards your next free bet (bets of a lower value do not affect your entitlement to the offer). And of course if you want to join in with a donation of your own – click below…..